In 1992 and 1993 I was looking with interest at the developments in Europebearing the name “European Project on Digital Broadcasting”. Seeing what was brewing in Europe, the VADIS Strategic Advisory Group asked me to organise a “European Seminar on Digital Television”. This was held in Geneva hosted by the EBU in February 1993 and attended by more than 100 participants, representing different companies and a dozen or so relevant European projects. My (private) comment when I first heard of the European Project on Digital Broadcasting was that the initiative was good, but for two letters, the E and the B. When the project had become Digital Video Broadcasting (DVB), I said to myself (how insatiable I am) that again the initiative was good, but for two letters, the V and the B. At that time, however, my involvement in MPEG, VADIS and my company duties occupied all my time and I had no time to go beyond such lazy thoughts. I really had no time for a deeper involvement. Until the November 1993 MPEG meeting my overriding goal was to make sure that MPEG would indeed produce the MPEG-2 CD as planned. If that goal had been missed, MPEG could very well have lost the confidence that the worldwide television industry had clearly placed on it: providing the technology to overhaul the 50-year old analogue television world with its billion receivers and its established business models, mostly dictated by the scarcity of spectrum, to the digital world with its unknown paradigms, fearful to some. The digital television technology was being prepared while Europe, Japan and United States were handling the analogue-to-digital transition with largely incompatible strategies. If the complexity of the technical endeavour, viz. multi-program transport layer, video coding layer supporting interlace and scalability, backwards-compatible multichannel audio coding layer and DSM-CC, is added to the fray, it should be no surprise that I had been single-mindedly locked in until the Seoul meeting in November 1993, when MPEG-2 achieved the official Committee Draft (CD) status. Upon my return from Seoul, for the first time in 6 years I had some time to think about the foundation of the work that I had started in 1988 with MPEG-1. I realised that the enabling technology role that MPEG had defined for itself was crucial to enable the development of a common digital television technology, a continuation of the IVICO idea in other – forced – forms. The work, however, even if successful was insufficient to guarantee complete End-to-End interoperability within the same applications, across different regions of the world or, across different applications even. A few weeks after my return from Seoul, I had gone a long way from my original idle thoughts about my preferred use of letters in acronyms of European initiatives and I had already identified the missing link: to provide – at the terminal and service level – the kind of interoperability that MPEG standards had enabled at the signal processing level. To provide an example, an MPEG Video decoder can decode both 625/50 and 525/60 video, but what if the display only supports one of the two video formats? Because of that last missing link the user will be unable to get the information, and knowing that “inside”, “in the digital domain” everything works fine, will definitely not comfort him. These kind of obstacles were bound to appear all over the place, because the systems to be built with digital technologies were so complex and the opportunities to recreate – maybe unwillingly – the same kinds of incompatible system that our forefathers had – maybe willingly – designed and built in were so many. 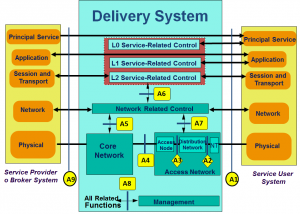 End-to-End interoperability had to be a requirement explicitly set in the system design. To achieve these further goals, some extra “glue” had to be standardised. Specifically, and in my order of perceived importance, these were: information representation, mid-layer protocols and physical layers. The place to develop this “glue” was the next question. In an ideal world an appropriate committee of a formal SDO should have settled this issue. Unfortunately, the “glue” spanned technology areas that are the competence of all three main international standards organisations and, within each of them, the competence for it was scattered across multiple committees. SDOs were and still are organised along traditional vertically integrated systems to serve specific industries, with objective difficulties in addressing cross-industry issues. I saw no chance of achieving the allocation of the work I had in mind in a reasonable amount of time and measurable amount of effort. So I came to the conclusion that I needed a new organisation where the different business interests represented by Broadcasting, CE, IT and Telecommunication industries could coexist and operate in a synergistic way. The operating principles of the new organisation would be similar to those of MPEG but, unlike MPEG’s mission of technology development, the new initiative would have a largely “system integration” mission. The Digital Audio-Visual Council (DAVIC) is an International Organisation established to promote the timely and coordinated development of audio-visual applications and services and of the hardware and software components making them possible in a way that maximises interoperability across services/applications and countries. So, instead of following the established procedure and proposing a New Project (NP) as per the ISO/IEC directives, a person who had been engaged in formal international standardisation for years had to join the growing list of founders of the “forum du jour”. But in my view DAVIC was meant to be the body that would serve the needs of these manifold industries; it could never have been a Technical Committee of ISO/IEC or a Study Groups of ITU, at least not in a time span of practical interest. So started the DAVIC initiative. The idea of a new organisation was proposed and accepted at a “founding” meeting in Geneva (March 94) hosted by Pierre-André Probst, then of Swisscom. Pierre-André was the chairman of CCITT SG XV, but he, too, understood that DAVIC’s goals could not be achieved within a known formal standardisation environment. The meeting saw the participation of some 50 delegates representing 40 companies from 17 countries. The industries represented broadcasters, telcos, IT and CE companies, research establishments and others. The vision is to create the conditions that will enable producers of Digital Audio-Visual (DAV) information to reach the widest possible audience, users to have seamless access to DAV information, carriers to effectively transport DAV information and makers of hardware and software products to provide the means to support unrestricted production, flow and use of DAV information. A preparatory meeting was held at Chester and Newark, NJ (April 94), followed by the “DAVIC Opening Forum” held in San José, CA (June 94). On that occasion, the scope of DAVIC was discussed through workshop-style presentations of more than 50 papers. The organisation was then formally established in Geneva as a not-for-profit organisation (August 94). The statutes were derived from the ATM Forum charter. Me Jean-Pierre Jacquemmoud, a lawyer in Geneva, took care of the legal side of the registration and his law firm provided the domiciliation of the organisation. The DAVIC organisational structure was based on a General Assembly (GA) of members, chaired by the President. The GA had all the powers, in particular those of approving work programs and specifications. In addition there was a Board of Directors (BoD) managing the day-to-day business of the association. Reporting to the BoD was the Management Committee (MC), in charge of supervising the work of the Technical Committees, which were in charge of developing the technical specifications. I was appointed as President and Chairman of the Board. The first CfP was issued at the Paris meeting (September 94) and sixty responses were received and discussed at the Tokyo meeting (December 94). The submissions were further considered and the scope of the first DAVIC specifications defined at the Orlando, FL meeting (January 95). While the technical work continued, a Strategic Planning Advisory Committee (SPAC) was set up at the London meeting (March 95) to advise on strategic lines of specification development. The Procedures for Technical Work were developed and approved at the Melbourne meeting (June 95). The long-term DAVIC work plan, identifying topics covering the next two years of work, was developed through a process of inquiry of members’ opinions and approved at the Hollywood meeting (September 95). Finally the DAVIC 1.0 specification was approved and the CfP for the next phase of work drafted and published at the Berlin meeting (December 95), exactly at the time that had been decided and announced at the founding meeting 20 months before. The DAVIC 1.0 specification is an outstanding piece of technology integration. DAVIC 1.0 defines a System Reference Model depicted in the figure below. 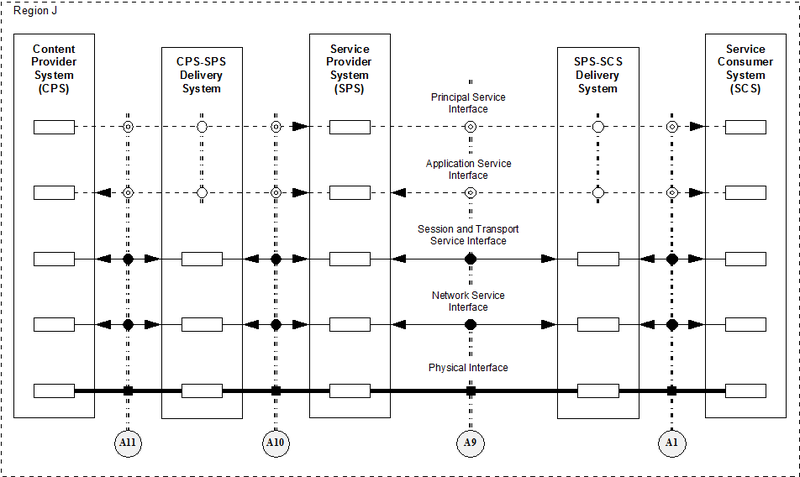 The Reference Model comprises three separate systems, the Content Provider (CP) System (CPS), the Service Provider (SP) System (SPS) and the Service User System (SUS), interconnected by Delivery Systems. The first (CPS to SPS) part was not initially considered and attention concentrated on the SPS to SUS part. Nine interfaces, A1 to A9 were defined (another critical A0 interface in the end-user device was added later) and most of them defined. DAVIC worked out the 5 types of signals – S1 to S5 – that are required between a server and a client linked by a telecommunication network. 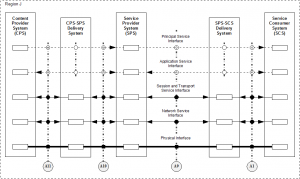 Service Related Control, providing all control for the services that are offered by the Delivery System. Network Related Control, providing control functions for network configuration, connection establishment and termination, and information routing. Core Network, responsible for accepting information flows and transmitting the information, error-free, from a source location to a destination location. This network can be characterised as a high speed digital network or series of networks. Access Node, responsible for processing information flows in preparation for transport through the selected distribution network. 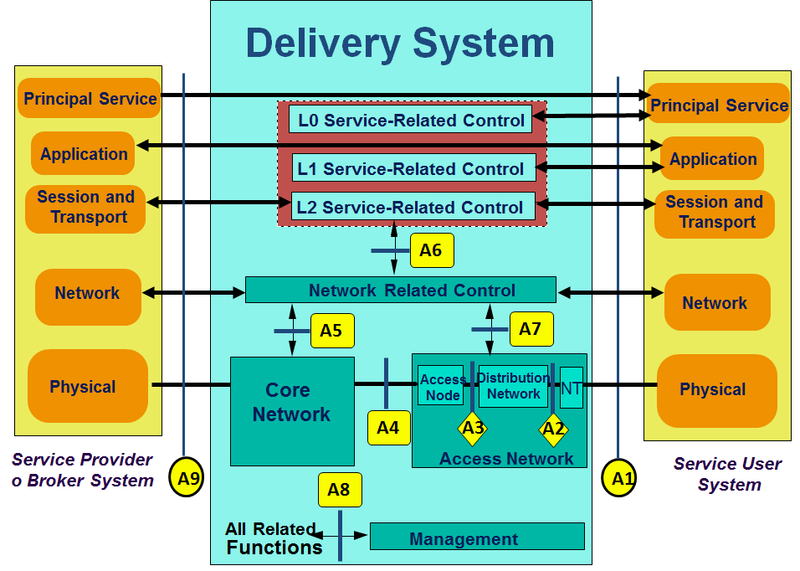 Distribution Network, the transport medium utilized to deliver information flows from a source location to a destination location. Network Termination, an optional entity used to adapt information flows from one network configuration to a second. This device, if used, serves as a bridge for the system. Management, responsible for the operation and maintenance functions of the network. In most instances, the Management Entity will communicate using S5 information flows. DAVIC adopted the MPEG-2 trial for the audio-visual component, DSM-CC User to Network for session set up, DSM-CC User to User for interaction with content, MHEG for multimedia composition and other technologies. A great effort was made at aligning different physical layer technologies for delivery of MPEG-2 content: Fiber to the Curb (FTTC), Hybrid Fiber Coax (HFC) and Asymmetric Digital Subscriber Line (ADSL). The last technology in the list justifies a short digression. At the first Kurihama meeting in November 1989, Charlie Judice, then with Bellcore, organised a dinner inviting a selected number of people and talked about some research work called Asymmetric Digital Subscriber Line (ADSL) that was being carried out by his organisation. I heard the ADSL acronym for the first time on that occasion and I became an immediate convert. Upon my return to CSELT, I widely promoted the idea, just to discover that my words were falling on deaf ears. I did get one positive response at the next COST 211 meeting, where the chairman Helga Séguin of France Telecom took the matter to heart and triggered the Eurescom project called Interactive Multimedia Services at 1 Mbit/s (IMS-1) that was approved and went as far as setting up a demonstrator. At that time telcos never did much with ADSL, beyond a few trials, such as the Italian Video Magic VoD trial service of Stream, a STET company, that eventually became part of what is now Sky Italia. While ADSL is now the way to deliver “broadband”, at that time the technology never got the opportunity to achieve the critical mass that would trigger sufficient interest to invest in its industrialisation. The reasons will be understood from this other short story. In 1993-94 I was advising an Italian manufacturer of telecommunication equipment, who wanted to develop a strategy for interactive video services, as part of my work at CSELT. When I heard of their intention to use ADSL, my old interest was revived. I was too quick because my words were quickly dismissed. “We do not like 1st generation ADSL” – they said – “that is too low quality. We want 8 Mbit/s that will be provided by the new generation of ADSL”. The result was that 1st generation ADSL was not industrialised and the 2nd generation never really took off in those years. Today, some 20 years later, ADSL is widely deployed at bitrates spanning the 1 to 20 Mbit/s range. The problem is that in the mean time no broadband services were deployed and when they did, the deployment followed the rules set by other industries, not by the telcos. As for the other initiatives in which I had taken part, my group had not been sitting idle. Starting from the MPEG-2 decoders built in the VADIS project, my group realised a complete End-to-End DAVIC system (the SPS to SUS part of DAVIC 1.0) under the name ARMIDA and proudly showed it at the MPEG meeting in Florence in March 1996. The two years it took to build an organisation and develop such complex specifications as DAVIC 1.0, that cut across the businesses of all players in the audio-visual world, are proof that SDOs – whether formal or not – can provide – if there is a will – timely responses to standardisation needs, no matter how complex and “converging” the issues are. The DAVIC experience has been unique. For the first time representatives of all industries – not just the researchers – had the opportunity to sit together, agree on a common reference model, and specify the entire delivery chain and the interfaces and protocols that were needed to achieve the seamless flow of information that the DAVIC Statutes advocated. The year 1995 was very demanding at the personal level. Just after the MPEG Singapore meeting in November 1994 I had been affected by a very serious illness that had prevented my attendance at two key DAVIC meetings in December 1994 and January 1995. Thanks God my health started recovering in spring 1995, but the negative influence of that illness extended well into mid-1995. At the professional level in that year I was engaged in the preparation and chairing of 6 DAVIC meetings and 3 MPEG meetings that dealt with the conclusion of MPEG-2 and the start of MPEG-4, in addition to my customary work of promoting my different initiatives. At the company level, my employer was getting more and more interested in the DAVIC work because of its Socrate Project aimed at providing VoD services nationwide. The DAVIC membership continued to grow and reached 220 corporate members at the time of the December 1995 meeting. Unfortunately the excitement of the first months of 1994 began to subside when accountants in the telcos started assessing the likely ROI date in DAVIC-enabled VoD services. The high costs included in particular the ATM technology, which had been taken as the basis for deployment of the telecommunication networks underpinning DAVIC services. These costs looked all the more unjustified when compared with the advantages of choosing the much cheaper IP-based equipment provided by the IT industry that in that time frame was leaving its original “internet for research” ghetto in which the telcos’ OSI support policy had confined it. Infighting on petty technology choices had started delaying the work in some Technical Committees very much as is customary in other bodies that I used to quote as examples not to be followed. Finally the BoD and MC duality of roles, the result of the original need to provide enough relevant positions to all major players, started to take its toll. At the December 1995 meeting in Berlin, after the GA had approved DAVIC 1.0, I announced my resignation. I had given the best of myself to the DAVIC initiative, probably much more than I have ever given to an initiative in such a short period of time, but I did not feel like I wanted to continue to be involved in it. I thought that having produced the first epoch-marking specification, and having left a comprehensive work plan that covered two years of work after my departure, would have allowed DAVIC to continue playing the central role for which I had created it with such a wide support. This did not happen. After I left DAVIC contravened the most fundamental “one functionality-one tool” principle of standardisation by adopting another audio coding technology next to one already adopted from MPEG. The publication of DAVIC as ISO/IEC 16500 through the ISO Publicly Available Specification (PAS) process turned out to be a pure publishing effort. A poison-pill clause that I had inserted in the DAVIC statutes mandated a positive vote of 2/3 of its members after 5 years for the organisation to continue for another 5 years. The membership chose not to give its vote of confidence in the organisation and DAVIC was wound up.